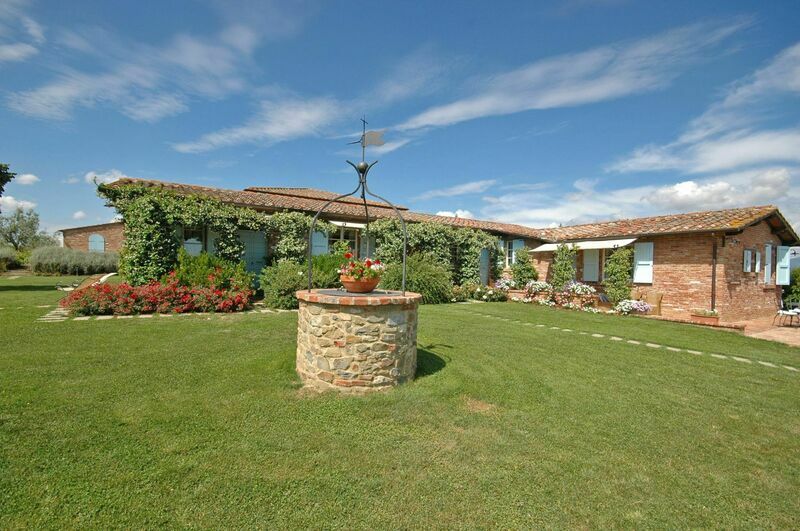 Charming stone complex quietly situated offering extensive views over the surrounding landscape. This property has been recently and carefully restored preserving its original architectural features and turned into 6 comfortable apartments all of which tastefully furnished in a Tuscan style. The access to the property is via an unpaved but well-maintained road. Distances: Pozzo della Chiana with all kinds of shops 1,5 km away, Foiano della Chiana 2,5 km, Monte San Savino 10 km, the beautiful medieval town of Cortona approx. 20 km away, Arezzo 30 km. At guests’ disposal: large fenced furnished garden, swimming-pool (7 x 14 m – maximum depth 2 m – open from 01/05 to 30/09), spacious outdoor furnished areas, barbecue, table-tennis, playground for children. Shared washing-machine. All of the apartments are provided with a telephone and offer a private furnished area with gazebo. Parking within the grounds. Air-conditioning provided in all of the apartments. Extra services: baby bed available on request (€ 40,- / per week to be paid on the spot). Maid service available by arrangement (payment on site). Internet access (ADSL) € 30,- / per week to be paid on the spot. Ground floor: large living-room (satellite TV) with sofa bed, kitchen corner (microwave, dishwasher, freezer, American coffee maker) and dining area, double bedroom with ensuite toilet, bathroom with shower.